No one can resist Brussels sprouts sautéed with bacon, mushrooms, onions, garlic and chicken broth, then topped with Parmesan — a recipe that will convert haters. I live with a guy who was not thrilled when he heard Brussels sprouts were on the menu. He had only experienced boiled-to-death sprouts and wasn’t in a hurry to have them again. I assured him that my roasted Brussels sprouts would be different since they caramelize a bit in the oven and soak up flavor from garlic and herbs. They say you shouldn’t try to change a man, that’s true. But you can change their mind. He loved those sprouts. The other night I made parmesan-crusted tilapia and couscous for dinner and thought Brussels sprouts would go really well with it. I remembered a pasta that my friend Jasper made for us during the winter in San Francisco with shredded sprouts, prosciutto and other goodies. I searched for a recipe online, found one from Serious Eats that used bacon and adapted that to my taste, thinly slicing instead of halving the sprouts and adding mushrooms. Divine. Seriously the best Brussels sprouts I have ever had. We devoured them. One nutrition fact about Brussels sprouts: All cruciferous vegetables contain glucosinolates, anti-cancer compounds, but Brussels sprouts have the highest level. Also, over-cooking by boiling reduces the level of glucosinolates, but not steaming or stir-frying, so sauté away! You’ll need a large skillet with a lid. In a large skillet, cook the bacon until it just begins to crisp. Add enough olive oil for sauteing and then the Brussels sprouts, onion, mushroom and red bell pepper. Cook until the onion, mushroom and pepper are crisp-tender. Add the garlic and cook until it begins to golden. Add the chicken broth and cook until it’s absorbed. 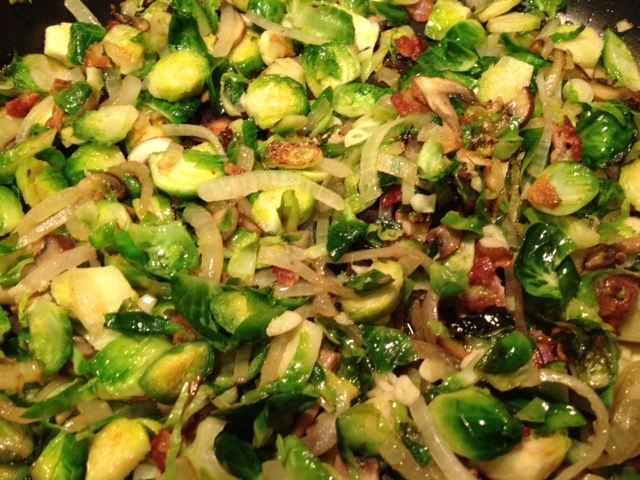 By now the Brussels sprouts should be tender as well. If not, cover the skillet and let them steam, adding more broth if necessary. Stir in cranberries, if you wish. Remove from the heat and add Parmesan, if you wish.